New Aerohive AP230 Wireless Access Point 802.11ac/n 3X3:3 Dual Radio. Without power supply - Internal Antennas. 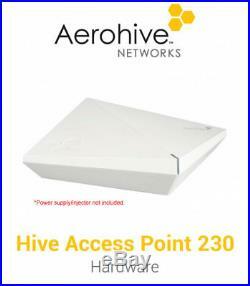 Aerohive Networks AP230 Enterprise access points set a new price / performance standard for 802.11ac APs. By combining the latest in 3x3, 3-stream 802.11ac Gigabit Wi-Fi technology and advanced security and mobility management together into an economical package it allows you to deploy 802.11ac into every part of the network infrastructure from Corp HQ to remote branches and outlets to every campus and classroom. With HiveOS at its heart and the ability to provide full Wi-Fi functionality on legacy POE infrastructure, the AP230 maintains the controller-less price/performance standard Aerohive has set and creates solution pricing that allows enterprises of all sizes to broadly deploy 802.11ac for their mobility future. The AP230 provides high-performance, dual concurrent 2.4Ghz 802.11n/g/b radio with Turbo-QAMand 5Ghz 802.11ac/n/a radio with beamforming which can support legacy 802.11a, b, g and n clients and interoperate with the rest of the Aerohive Cooperative Control devices to provide a seamless enterprise-class experience for all connected users. Key Features and Benefits Engineered for Industry-leading price/performance The challenges of pervasive mobility high performance Wi-Fi, high client density, industry and government regulations, and advanced applications are no longer the exclusive domain of the large enterprise. The AP230 also incorporates enough processing horsepower to run sophisticated Application Visibility and Control functionality that allows for tracking of 700 application signatures and even enables custom application signature tracking all at Gigabit data rates. Now policies can be set on any application fingerprint; even proprietary enterprise applications. High Density Environments with Future-proof deployment The latest release of HiveOS combined with the AP230 allows an Aerohive-based network to create a plugn-play solution that addresses high-density, high-performance requirements while laying the ground work for a phased approach to upgrading your network to 802.11ac and without requiring you to upgrade your existing POE infrastructure. Our advancements in energy efficiency allow the AP230 to provide improved client capacity and full 3-stream 802.11ac performance while using existing POE infrastructure See Pg. As more APs are added to the network, HiveOS simply recognizes and automatically includes them in the network. Improvements to the radio management software account for the new 802.11ac radios automatically and allow for existing and new APs to coexist flawlessly. BYOD and Advanced Client Services When combined with Aerohives Cloud Services Platform and Mobility Suite, the AP230 even packs enough power to fully control your BYOD environment. The Aerohive Mobility Suite featuring Client Management and ID Manager applications leverages Aerohives HiveOS that runs on the AP230 and extends management and control over the complete spectrum of clients, from transient guests to company-issued devices. By combining simplified onboarding, management, and troubleshooting with context-based visibility, policies, and enforcement for all connected clients, Aerohive can provide a personalized mobile experience for every user and device on the network. 3x Integrated single band, 2.4-2.5 GHz Omni-directional antennas, 6.0 dBi peak gain 3x Integrated single band, 5.1-5.8 GHz Omni-directional antennas, 6.0 dBi peak gain. 2x autosensing 10/100/1000 Base-T Ethernet Ports Dual Ethernet ports with backhaul capabilities Link Aggregation supported via Ether channel (link aggregation) 1x Serial RJ45 port USB 2.0 port (Future use) 1x Reset Pinhole. WxHxD: 7.25 x 7.25 by 1 7/8 tall plus. 25 for the mounting hardware so 2.12 (5.4 cm) high total Weight: 1.6 lbs. Operating: 0 to 40°C, Storage: -40 to +70°C, Humidity: 95%. AC/DC power adapter: Input: 100240 VAC Output: 12v/2.0A (Not Include) PoE nominal input voltages: 48V, 0.35A, (802.3af) 48V, 0.625A (802.3at) RJ-45 power input pins: Wires 4,5,7,8 or 1,2,3,6 802.3af compatible with Cat-5 cable or higher (up to 14.5W draw with full functionality). 5.1505.950 GHz Operating Frequency Orthogonal Frequency Division Multiplexing (OFDM) Modulation Rates (Mbps): 54, 48, 36, 24, 18, 12, 9, 6 w/ auto fallback. 2.42.5 GHz Operating Frequency Orthogonal Frequency Division Multiplexing (OFDM) Modulation 20 dBm (100 mW) Transmit Power Rates (Mbps): 54, 48, 36, 24, 18, 12, 9, 6 w/ auto fallback. 2.42.5 GHz & 5.1505.950 GHz Operating Frequency 802.11n Modulation Rates (Mbps): MCS0MCS23 (6.5Mbps - 450Mbps) 3x3:3 Stream Multiple-In, Multiple-Out (MIMO) Radio HT20 High-Throughput (HT) Support (for both 2.4 GHz and 5 GHz) A-MPDU and A-MSDU Frame Aggregation. 5.1505.950 GHz Operating Frequency 802.11ac Modulation (256-QAM) Rates (Mbps): MCS0MCS9 (6.5Mbps - 1300Mbps), NSS = 1-3. 3x3:3 Stream Multiple-In, Multiple-Out (MIMO) Radio VHT20/VHT40/VHT80 support. Item will be sent through Australia Post. All Specs are taken from the manufactures/third party websites. They are subject to change without notice. If this item carries a manufacturers guarantee it should be noted above. Under most circumstances, return of the item is not accept for change of mind or wrong decision made (including compatibility issue). The item "New Aerohive AP230 Wireless Access Point 802.11ac/n 3X33 Dual Radio Wifi AP" is in sale since Thursday, July 26, 2018. This item is in the category "Computers/Tablets & Networking\Home Networking & Connectivity\Wireless Access Points". The seller is "ozcomputerparts" and is located in Canley Vale. This item can be shipped worldwide.